So it seems we have an overnight success, or what seems like one anyway. 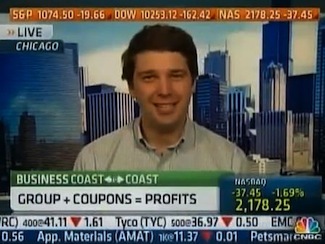 Out of nowhere Groupon Inc., the Chicago based coupon site, has become a tech superstar, so much so the company has spurned a $6 billion offer from Google this month. Groupon has now filed to raise up to $950 million from the sale of preferred stock. Groupon offers local deals for businesses like restaurants, clothing, entertainment and other items in more than 300 cities nationwide and has become very popular in this cash strapped economy. So much so that analysts are predicting that sales will top $500 million this year. What does this exactly mean for the future of Groupon? Well, no one can be certain, but it seems as if the company is going to make a large capital investment in growing the business. Groupon just amended its certificate of incorporation which will allow it to issue 30 million shares of Series G preferred stock, at a price of $31.59 a share. Once this preferred sale is complete the companies value would be estimated at $7.8 billion. Chief Executive Officer Andrew Mason seems to be raising a little spending money and staffing his company with superstars, while he ponders whether or not to go ahead with an initial public offering in 2011. Amazon.com Inc's former vice president of finance, Jason Child, joined the Groupon executive team last week, and will serve as the chief financial officer. Considering the popularity of the service many have wondered what the next step will be for Groupon: growth or profit margin considerations? Greg Sterling, an analyst at Internet2Go, said, "They'll move into more new markets, and that either means buying an existing company, which they've done in Europe, or establishing the infrastructure they need on the ground, which would mean hiring people." If in fact the company does raise as much as $950 million through this preferred stock sale, investors eager to jump on the Groupon bandwagon may be forced to wait yet again. It seems if this capital is raised the IPO could be pushed back to 2012 as the fluid capital that is generated by an IPO will no longer need to be infused at this time. Sterling makes a very valid point when he said, "Ultimately, they need to go public unless somebody's going to come forward with a super massive offer." What is a super massive offer you ask? Apparently it would be a lot more than the Google offer of $6 billion, otherwise the sale would have been made. Whatever happens, it will be interesting to keep an eye on the status of this potential IPO, and assuming the stock prices stay in line with the preferred stock being issued, this could be a company many of us wish to sink our hard earned dollars into. Let me ask you, the Techno Buffalo faithful, would you buy Groupon stock if they had an IPO today with a price of $31 per share? If not what price point would tempt your investment funny bone? Give me your thoughts below.